This is the first in a series of posts discussing various aspects of MT quality from the context of enterprise use and value, where linguistic quality is important, but not the only determinant of suitability in a structured MT technology evaluation process. A cleaner, more polished, and shorter studio version of this post is available here. You can consider this post a first draft, or the live stage performance (stream of consciousness) version. What is BLEU (Bilingual Evaluation Understudy)? As the use of enterprise machine translation expands, it becomes increasingly more important for users and practitioners to understand MT quality issues in a relevant, meaningful, and accurate way. 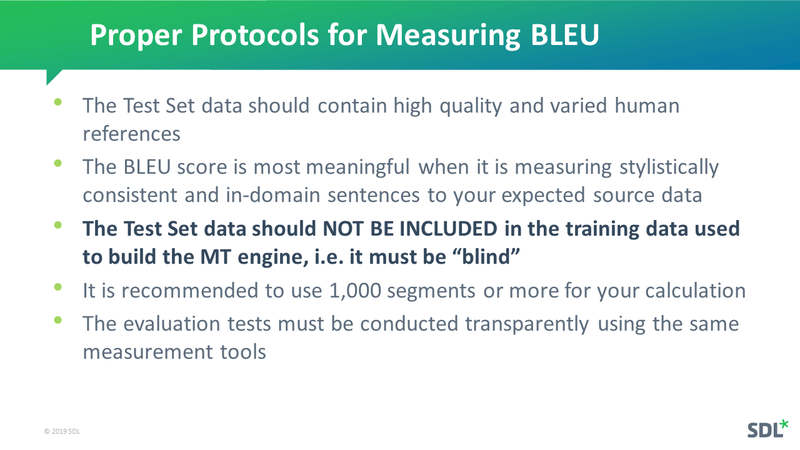 The BLEU score is a string-matching algorithm that provides basic output quality metrics for MT researchers and developers. 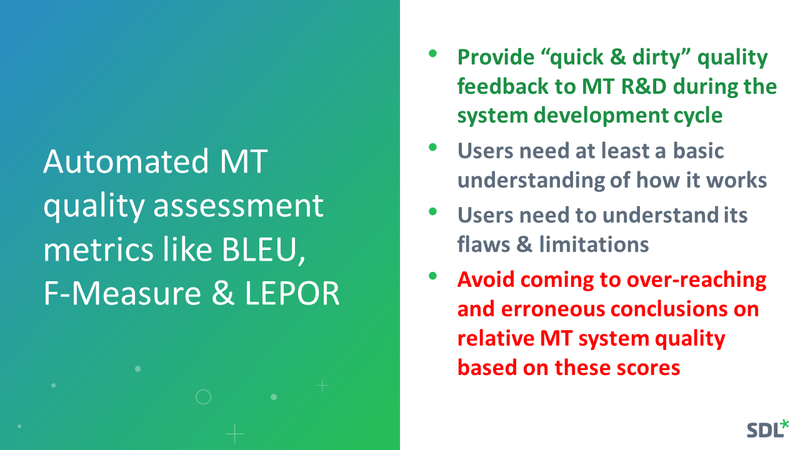 In this first post, we will review and look more closely at the BLEU score, which is probably the most widely used MT quality assessment metric in use by MT researchers and developers over the last 15 years. While it is widely understood that the BLEU metric has many flaws, it continues to be a primary metric used to measure MT system output even today, in the heady days of Neural MT. Firstly, we should understand that a fundamental problem with BLEU is that it DOES NOT EVEN TRY to measure “translation quality”, but rather focuses on STRING SIMILARITY (usually to a single human reference). What has happened over the years is that people choose to interpret this as a measure of the overall quality of an MT system. BLEU scores only reflect how a system performs on the specific set of test sentences used in the test. As there can be many correct translations, and most BLEU tests rely on test sets with only one correct translation reference, it means that it is often possible to score perfectly good translations poorly. The scores do not reflect the potential performance of the system on other material that differs from the specific test material, and all inferences on what the score means should be made with great care, after taking a close look at the existing set of test sentences. 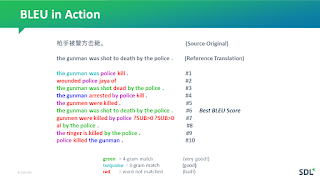 It is very easy to use and interpret BLEU incorrectly and the localization industry abounds with examples of incorrect, erroneous, and even deceptive use. 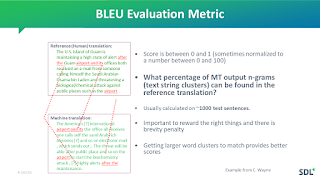 Very simply stated, BLEU is a “quality metric” score for an MT system that is attempting to measure the correspondence between a machine translation output and that of a human with the understanding that "the closer a machine translation is to a professional human translation, the better it is" – this is the central idea behind BLEU. 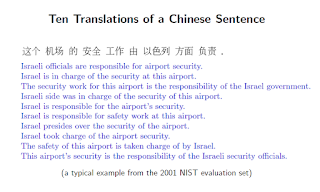 Scores are calculated for individual MT translated segments—generally sentences—by comparing them with a set of good quality human reference translations. Most would consider BLEU scores more accurate at a corpus level rather than at a sentence level. BLEU gained popularity because it was one of the first MT quality metrics to report a high correlation with human judgments of quality, a notion that has been challenged often, but after 15 years of attempts to displace it from prominence, the allegedly “improved” derivatives (METEOR, LEPOR) have yet to really unseat its dominance. BLEU together with human assessment remains the preferred metrics of choice today. BLEU is actually nothing more than a method to measure the similarity between two text strings. To infer that this metric, which has no linguistic consideration or intelligence whatsoever, can predict not only past “translation quality” performance, but also future performance is indeed quite a stretch. Measuring translation quality is much more difficult because there is no absolute way to measure how “correct” a translation is. MT is a particularly difficult AI challenge because computers prefer binary outcomes, and translation has rarely if ever only one single correct outcome. Many “correct” answers are possible, and there can be as many “correct” answers as there are translators. 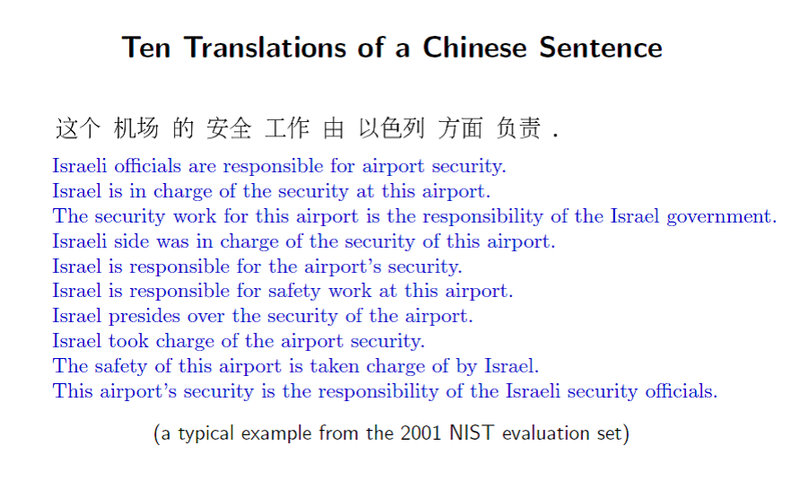 The most common way to measure quality is to compare the output strings of automated translation to a human translation text string of the same sentence. The fact that one human translator will translate a sentence in a significantly different way than another human translator, leads to problems when using these human references to measure “the quality” of an automated translation solution. The BLEU metric scores a translation on a scale of 0 to 1. The metric attempts to measure adequacy and fluency in a similar way to a human would, e.g. does the output convey the same meaning as the input sentence, and is the output good and fluent target language? The closer to 1, the more overlap there is with a human reference translation and thus the better the system is. In a nutshell, the BLEU metric measures how many words overlap, giving higher scores to sequential words. 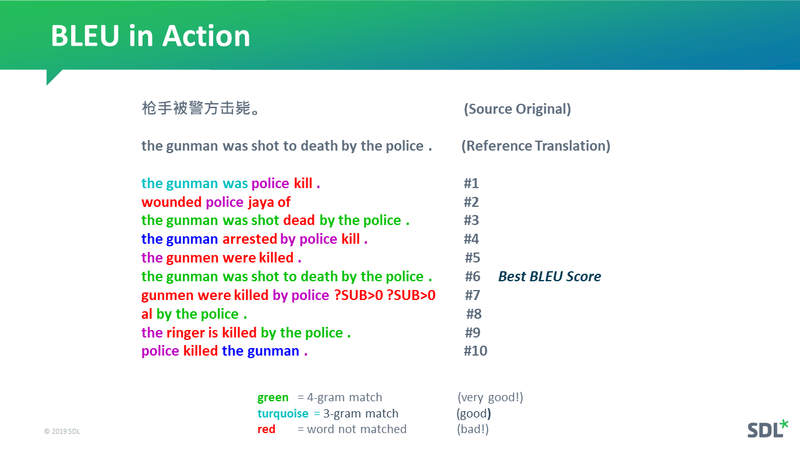 For example, a string of four words in the translation that match the human reference translation (in the same order) will have a positive impact on the BLEU score and is weighted more heavily (and scored higher) than a one or two-word match. It is very unlikely that you would ever score 1 as that would mean that the compared output is exactly the same as the reference output. However, it is also possible that an accurate translation would receive a low score because it uses different words than the reference used. This problem potential can be seen in the following example. If we select one of these translations for our reference set, all the other correct translations will score lower! One or more human reference translations. (This should be data which has NOT been used in building the system (training data) and ideally should be unknown to the MT system developer. It is generally recommended that 1,000 or more sentences be used to get a meaningful measurement.) If you use too small a sample set you can sway the score significantly with just a few sentences that match or do not match well. Automated translation output of the exact same source data set. A measurement utility that performs the comparison and score calculation for you. Studies have shown that there is a reasonably high correlation between BLEU and human judgments of quality when properly used. BLEU scores are often stated on a scale of 1 to 100 to simplify communication but should not be confused with the percentage of accuracy. Even two competent human translations of the exact same material may only score in the 0.6 or 0.7 range as they likely use different vocabulary and phrasing. We should be wary of very high BLEU scores (in excess of 0.7) as it is likely we are measuring improperly or overfitting. A sentence translated by MT may have 75% of the words overlap with one translator’s translation, and only 55% with another translator’s translation; even though both human reference translations are technically correct, the one with the 75% overlap with machine translation will provide a higher “quality” score for the automated translation. This is somewhat arbitrary. Random string matching scores should not be equated to overall translation quality. Therefore, although humans are the true test of correctness, they do not provide an objective and consistent measurement for any meaningful notion of quality. As would be expected using multiple human reference tests will always result in higher scores as the MT output has more human variations to match against. 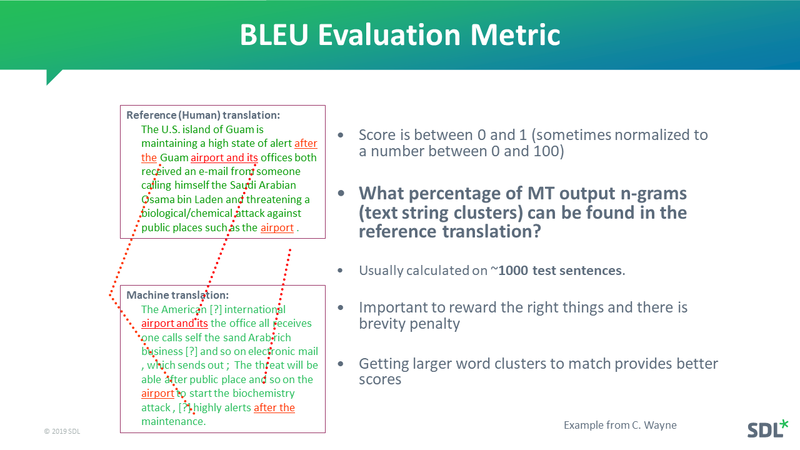 The NIST (National Institute of Standards & Technology) used BLEU as an approximate indicator of quality in its annual MT competitions with four human reference sets to ensure that some variance in human translation is captured, and thus allow more accurate assessments of the MT solutions being evaluated. The NIST evaluation also defined the development, test, and evaluation process much more carefully and competently, and thus comparing MT systems under their rigor and purview was meaningful. This has not been true for many of the comparisons done since, and many recent comparisons are deeply flawed. Why are automated MT quality assessment metrics needed? 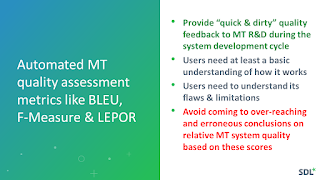 Automated quality measurement metrics have always been important to the developers and researchers of data-driven based MT technology, because of the iterative nature of MT system development, and the need for frequent assessments during the development of the system. They can provide rapid feedback on the effectiveness of continuously evolving research and development strategies. Recently, we see that BLEU and some of its close derivatives (METEOR, NIST, LEPOR, and F-Measure) are also often used to compare the quality of different MT systems in enterprise use settings. This can be problematic as a “single point quality score” based on publically sourced news domain sentences is simply not representative of the dynamically changing, customized, and modified potential of an active and evolving enterprise MT system. Also, such a score does not incorporate the importance of overall business requirements in an enterprise use scenario where other workflow, integration, and process-related factors may actually be much more important than small differences in scores. Useful MT quality in the enterprise use context will vary greatly, depending on the needs of the specific use-case. Most of us would agree that competent human evaluation is the best way to understand the output quality implications of different MT systems. However, human evaluation is generally slower, less objective, and likely to be more expensive and thus not viable in many production use scenarios when many comparisons need to be made on a constant and ongoing basis. Thus, automated metrics like BLEU provide a quick and often dirty quality assessment that can be useful to those who actually understand its basic mechanics. However, they should also understand its basic flaws and limitations and thus avoid coming to over-reaching or erroneous conclusions based on these scores. Buyer Mode: In comparing different MT systems from different vendors and deciding which one is the “best” one. The MT System Research & Development Need: Data-driven MT systems could probably not be built without using some kind of automated measurement metric to measure ongoing progress. MT system builders are constantly trying new data management techniques, algorithms, and data combinations to improve systems, and thus need quick and frequent feedback on whether a particular strategy is working or not. It is necessary to use some form of standardized, objective and relatively rapid means of assessing quality as part of the system development process in this technology. If this evaluation is done properly, the tests can also be useful over a longer period to understand how a system evolves over many years. The MT Buyer Need: As there are many MT technology options available today, BLEU and its derivatives are sometimes used to select what MT vendor and system to use. The use of BLEU in this context is much more problematic and prone to drawing erroneous conclusions as often comparisons are being made between apples and oranges. 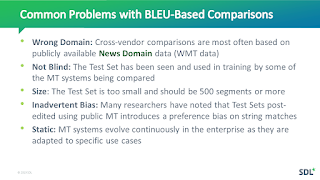 The most common error in interpreting BLEU is the lack of awareness and understanding that there is a positive bias towards one MT system because it has already seen and trained on the test data, or has been used to develop the test data set. While BLEU is very useful to those who build and refine MT systems, it’s value as an effective way to compare totally different MT systems is much more limited and needs to be done very carefully, if done at all, as it is easily and often manipulated to create the illusion of superiority. There are several criticisms of BLEU that should also be understood if you are to use the metric effectively. BLEU only measures direct word-by-word similarity and looks to match and measure the extent to which word clusters in two sentences or documents are identical. Accurate translations that use different words may score poorly since there is no match in the human reference. There is no understanding of paraphrases and synonyms so scores can be somewhat misleading in terms of overall accuracy. You have to get the exact same words used in the human reference translation to get credit e.g. 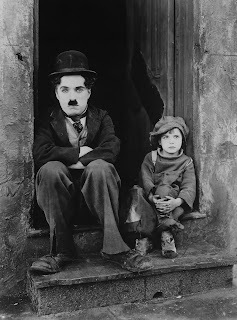 "Appeared calm when he was taken to the American plane, which will to Miami, Florida" would get the very same score as: "was being led to the calm as he was would take carry him seemed quite when taken". These and other problems are described in this article and this critical academic review. The core problem is that word-counting scores like BLEU and its derivatives - the linchpin of the many machine-translation competitive comparisons - don't even recognize well-formed language, much less real translated meaning. Here is a more recent post that I highly recommend, as it very clearly explains other metrics, and shows why it also still makes sense to use BLEU in spite of its many problems. For post-editing work assessments there is a growing preference for Edit Distance scores to more accurately reflect the effort involved, even though it too is far from perfect. The problems are further exacerbated with the Neural MT technology which can often generate excellent translations that are quite different from the reference and thus score poorly. Thus, many have found that lower (BLEU) scoring NMT systems are clearly preferred over higher scoring SMT systems when human evaluations are done. There are some new metrics (ChrF, SacreBLEU, Rouge) attempting to replace BLEU, but none have gathered any significant momentum yet and the best way to evaluate NMT system output today is still well structured human assessments. What is BLEU useful for? Modern MT systems are built by “training” a computer with examples of human translations. As more human translation data is added, systems should generally get better in quality. Often, new data can be added with beneficial results, but sometimes new data can cause a negative effect especially if it is noisy or otherwise “dirty”. Thus, to measure if progress is being made in the development process, the system developers need to be able to measure the quality impact rapidly and frequently to make sure they are improving the system and are in fact making progress. BLEU allows developers a way “to monitor the effect of daily changes to their systems in order to weed out bad ideas from good ideas.” When used to evaluate the relative merit of different system building strategies, BLEU can be quite effective as it provides very quick feedback and this enables MT developers to quickly refine and improve translation systems they are building and continue to improve quality on a long term basis. What is BLEU not useful for? BLEU scores are always very directly related to a specific “test set” and a specific language pair. 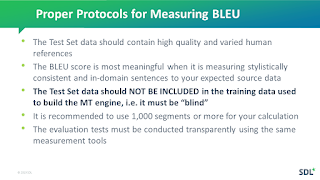 Thus, BLEU should not be used as an absolute measure of translation quality because the BLEU score can vary even for one language depending on the test and subject domain. In most cases comparing BLEU scores across different languages is meaningless unless very strict protocols have been followed. Because of this, it is always recommended to use human translators to verify the accuracy of the metrics after systems have been built. Also, most MT industry leaders will always vet the BLEU score readings with human assessments before production use. In competitive comparisons, it is important to carry out the comparison tests in an unbiased, scientific manner to get a true view of where you stand against competitive alternatives. The “test set” should be unknown (“blind”) to all the systems that are involved in the measurement. This is something that is often violated in many widely used comparisons today. If a system is trained with the sentences in the “test set” it will obviously do well on the test but probably not as well on data that it has not seen before. 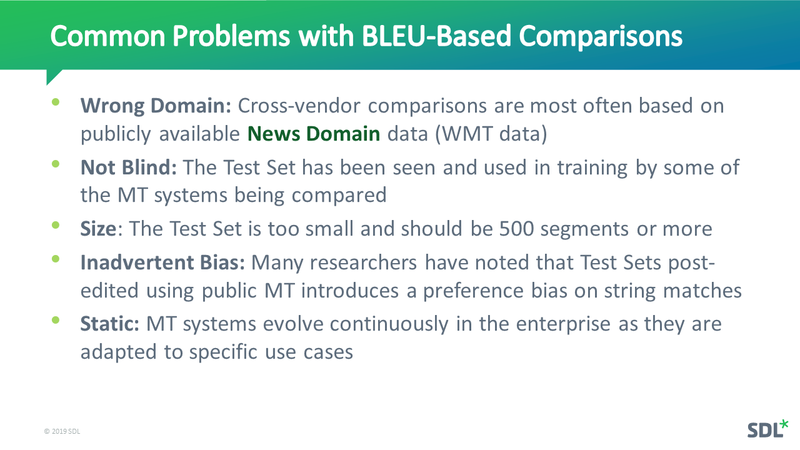 Many recent comparisons score MT systems on News Domain related test sets that may also be used in training by some MT developers. A good score on news domain may not be especially useful for an enterprise use case that is heavily focused on IT, pharma, travel or any domain other than news. However, in spite of all the limitations identified above, BLEU continues to be a basic metric used by most, if not all MT researchers today. Though, now, most expert developers regularly use human evaluation on smaller sets of data to ensure that they indeed have a true and meaningful BLEU. The MT community have found that supposedly improved metrics like METEOR, LEPOR, and other metrics have not really gained any momentum. BLEU and its flaws and issues are more clearly understood, and thus more reliable, especially if used together with supporting human assessments. Also, many buyers today realize that MT system performance on their specific subject domains and translatable content for different use cases matters much more than how generic systems might perform on news stories. In upcoming posts in this series, we will continue to explore the issue of MT quality from a broad enterprise needs perspective. More informed practices will result in better outcomes and significantly improved MT deployments that leverage the core business mission to solve high-volume multilingual challenges more effectively. 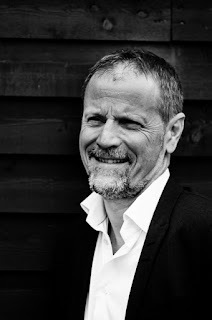 This is yet another post on Blockchain, a guest post by Robert Etches who presents his vision of what Blockchain might be able to be in the translation industry. A vision, by definition, implies a series of possibilities, and in this case, quite revolutionary possibilities, but does not necessarily provide all the details of how and what. Of course, the way ahead is full of challenges and obstacles which are much more visible to us than the promised land, but I think it is wise to keep an open mind and watch the evolution even if we are not fully engaged or committed or in agreement. Sometimes it is simply better to wait and see than to come to any final conclusions. 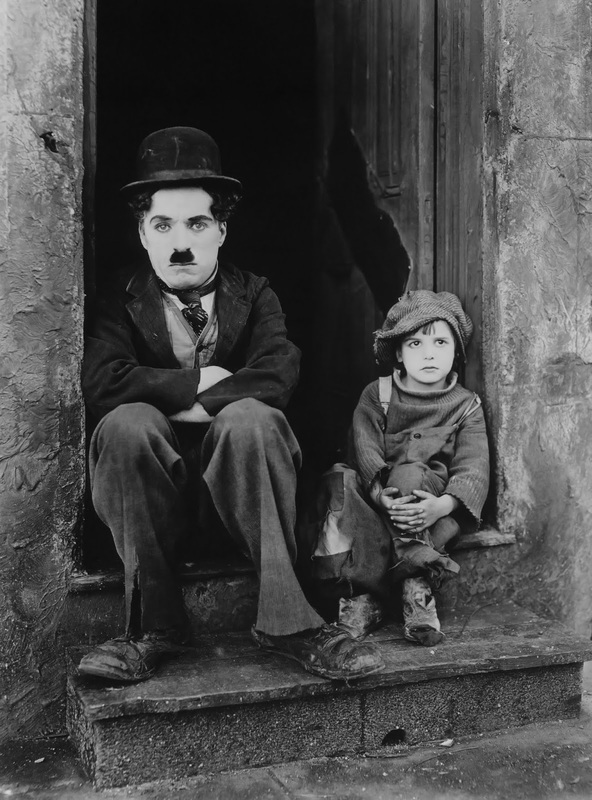 It is much easier to be dismissive and skeptical of upstart claims of fundamental change than to allow for a slim but real possibility that some new phenomenon could indeed be revolutionary. I wrote previously about CEO shortsightedness and what I called Roryisms. Here is a classic one from IBM that shows how they completely missed the boat because of their hubris and old style thinking. 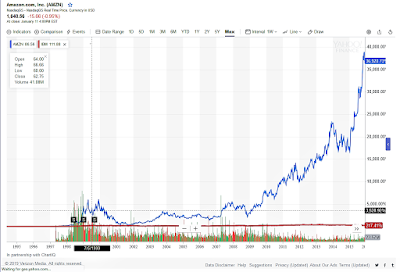 Gerstner is however credited with turning around a flailing mainframe business.The cost of missing the boat can be significant for some, and we need only look at relative stock price and market value improvements over time (as this is how CEO performance is generally measured) to understand how truly clueless our boy Lou and his lieutenants at IBM, in general, were when they said this. The culture created by such a mindset can last decades as we see by the evidence. Culture is one of a company’s most powerful assets right until it isn’t: the same underlying assumptions that permit an organization to scale massively constrain the ability of that same organization to change direction. More distressingly, culture prevents organizations from even knowing they need to do so. IBM’s chairman minimized how Amazon might transform retail and internet sales all the way back in 1999. 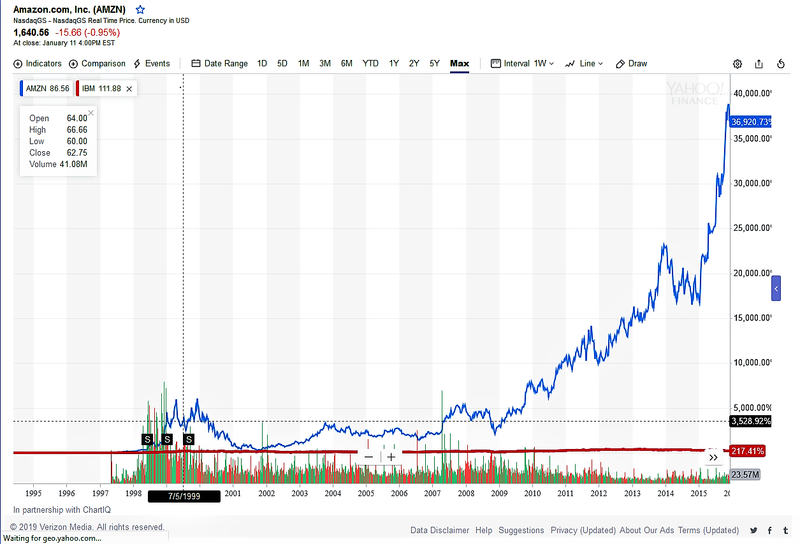 IBM is the flat red line in the chart above. IBM looks just as bad against Microsoft, Google, Apple, Oracle, and many others who had actual innovation. I bring attention to this, because, I also saw this week that IBM has filed more patents than any other company in the US in 2018, Samsung was second. In fact, IBM has been the top patent filer in the US for every year from 1996 to 2018. BTW they are leaders in blockchain patents as well. However, when was the last time that ANYBODY has associated IBM with innovation or technology leadership? 1980? Maybe they just have some great patent filing lawyers who understand the PTO bureaucracy and know how to get their filings pushed through. In fact, there have been some in the AI community who felt that IBM Watson was a joke and that the effort did not warrant serious credibility and respect. Oren Etzioni said this: “IBM Watson is the Donald Trump of the AI industry—outlandish claims that aren’t backed by credible data.” Trump is now a synonym for undeserved self-congratulation, fraud, and buffoonery, a symbol for marketing with false facts. IBM is also credited with refining and using something called FUD (fear, uncertainty, and doubt) as a deliberate sales and marketing misinformation tactic to keep customers from using better, more innovative but lesser-known products. We should not expect IBM to produce any breakthrough innovation in the emerging AI-first, machine learning everywhere world we see today, and most expect the company will be further marginalized in spite of all the patent filings. Some of you may know that IBM filed the original patents for Statistical Machine Translation, but it took Language Weaver (SDL), Google and Microsoft to really make it come to life in a useful way. IBM researchers were also largely responsible for conceiving of the BLEU score to measure MT output quality that was quite useful for SMT. However, the world has changed and BLEU is not useful with NMT. I plan to write more this year on how BLEU and all its offshoots are inadequate and often misleading in providing an accurate sense of the quality of any Neural MT system. "Conceptually, blockchain has the potential to revolutionize business processes in industries from banking and insurance to shipping and healthcare. Still, the technology has not yet seen a significant application at scale, and it faces structural challenges, including resolving the innovator’s dilemma. Some industries are already downgrading their expectations (vendors have a role to play there), and we expect further “doses of realism” as experimentation continues." While I do indeed have serious doubts about the deployment of blockchain in the translation industry anytime soon, I do feel that if it happens it will be driven by dreamers, rather than by process crippled NIH pragmatists like Lou Gerstner and Rory. These men missed the obvious because they were so sure they knew all there was to know and because they were stuck in the old way of doing things. While there is much about blockchain that is messy and convoluted, these are early days yet and the best is yet to come. 2018 was a kick-off year for language blockchain enthusiasts. At least five projects were launched, there was genuine interest expressed by the industry media, and two webinars and one conference provided a stage for discussion on the subject. Then it all went very quiet. So, what’s happened since? And where are we today? Subscribers to Slator’s latest megatrends can read that it’s same same in the language game for 2019: NMT, M&A, CAT, TMS, unit rates … how we love those acronyms! On the world stage, people could only shake their heads in disbelief regarding the meteoritic rise of the value of cryptocurrencies in 2017. However, in 2018 those same people relished a healthy dish of schadenfreude as exchange rates plummeted and the old order was restored with dollars (Trump), roubles (Putin), and pound sterling (Brexit) back in vogue. In other words, for the language industry and indeed for the world at large, “better the devil(s) we know” appears to be the order of the day. There is nothing surprising in this. Despite all the “out of your comfort zone” pep talks by those Cassandras of Change, the language industry continues to respect the status quo, grow and make money. Why alter a winning formula? And certainly, why even consider introducing a business model that expects translators to work for tokens?! Hello, crazy people!!! 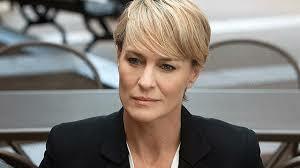 But maybe, just maybe, there was method in Hamlet’s madness and Apple was right when they praised the crazy ones? Let’s take a closer look at the wonderful world of blockchain and token economics, and how they are going to change the language industry … also the language industry. While blockchain holds long-term promise in transforming business and society, there is little evidence in short-term reality. Blockchain technologies offer new ways to exchange value, represent digital assets and implement trust mechanisms, but successful enterprise production examples remain rare. Technology leaders are intrigued by the capabilities of blockchain, but they are unclear exactly where business value can be achieved in the enterprise context. Most enterprise blockchain experiments are an attempt to improve today's business process, but in most of those cases, blockchain is no better than proven enterprise technologies. These centralized renovations distract enterprises from other innovative possibilities offered by blockchain. Blockchain technologies offer capabilities that range from incremental improvements to operational models to radical alterations to business models. The impact of blockchain’s trust mechanisms and interaction paradigms extends beyond today’s business and will affect the economy, society and governance. Many interpretations of blockchain today suffer from an incomplete understanding of its capabilities or assume a narrow scope. The seven-month leap from little evidence in short-term reality to will affect the economy, society and governance is akin to a rocket-propelled trip across the Grand Canyon! Little wonder that traditional businesses don’t know where to start even looking into this phenomenon, never mind taking on a new business model that basically requires emptying the building of 90% of hardware, software and, more important, people. Why does Deloitte have 250 people working in their distributed ledger laboratories? Because when immutable distributed ledgers become a reality they will put 300,000 people out of work at the big four accountancy companies. Why are at least 26 central banks looking into blockchain? Because there’s a good chance that private banks will be superfluous in 10-15 years’ time and we will all have accounts with central banks. Other than basically saying blockchain will change “everything”, the sentence mentions two factors that are core to blockchain: trust and interaction. Trust. What inspires me about blockchain is its transparency. A central tenet of blockchain is its truth gene. In a world in which even the most reliable sources of information are labeled as fake, blockchain’s traceability – its judgment in stone as to who did what, when and for whom – makes it a beacon of light. Just think if we could utilize this capability to solve the endless quality issue? What if the client always knew who has translated what – and could even set up selection criteria based upon irrefutable proof of quality from previous assignments? It is no surprise to learn that many blockchain projects are focusing on supply chain management. Interaction is all about peer-to-peer transactions through Ethereum smart contracts. It’s not just the central banks that will be removing the middlemen. Unequivocal trust opens the door to interact with anyone, anywhere. To a global community. These people of course speak and write in one or more of approximately 6,900 languages, so there’s a market for providing the ability for these “anyones” to speak to each other in any language. What a business opportunity! And what a wonderful world it would be! 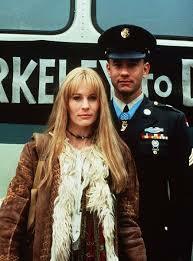 Just as Jenny and Forest went together like peas and carrots, so do tokens and blockchain. Unfortunately, this is where many jump off the train. One thing is accepting the relevance of some weird ledger technology that is tipped to become the new infrastructure for the Internet, another is trading in hard-won Venezuelan dollars for some sort of virtual mumbo jumbo! All fiat currencies are a matter of trust. None is backed by anything more than our trust in a national government behaving responsibly. In 2019 that is quite a scary thought – choose your own example of lemming-like politicians. All currencies (fiat or crypto) are worth what the market believes them to be worth. In ancient times a fancy shell from some far-off palmy beach was highly valued in the cold Viking north. Today not so. At its inception, bitcoin was worth nothing. Zero. Zip. Today 1 BTC = €3,508.74. Because people say so. Today, there is absolutely no reason why a currency cannot be minted by, well, anyone. There is indeed a school of thought that believes there will be thousands of cryptocurrencies in the non-too distant future. If we look at our own industry, we have long claimed that translation memories and termbases have a value. Why can that value not be measured in a currency unique to us and with an intrinsic value that we all respect and which is not subject to the whims of short-term political aspirations? Why can’t linguistic assets be priced in a Language Coin? An effective token strategy is one where the exchange of a token within a particular economy impacts human economic behavior by aligning user incentives with those of the wider Community. Think about this in the context of the language industry. What if the creation and QA of linguistic assets were tied to their own token? What if you – a private company, a linguist, an LSP, an NGO, an intranational organization – were paid in this token for your data and that the value of this data grew and grew year on year as it was shared and leveraged as part of a larger whole – the Language Community. What if linguists were judged by their peers and their reputations were set in stone? What if everyone was free to charge whatever hourly fees they choose, and that word rates and CAT discounts were a relic of the past? This is why blockchain feeds the token economy and why the token needs blockchain. Peas and carrots! If you hear a scenario about the world in 2050 and it sounds like science fiction, it is probably wrong; but if you hear a scenario about the world in 2050 and it does not sound like science fiction, it is certainly wrong. The pace of change will continue to accelerate exponentially, and I believe blockchain will be one of the main drivers. Already in 10-15 years, there will be some household (corporate) names and technologies that do not exist or have only just started today. And by 2050 the entire finance, food, and transport sectors (to name the obvious) will be ‘blockchained’ beyond recognition. At Exfluency, we see multilingual communication as an obvious area where a token economy and blockchain will also come out on top; I’m sure that other entrepreneurs in a myriad of other sectors are coming to similar conclusions. It’s going to be exciting! Krzystof Zdanowski, Yannis Evangelou & Robert Etches, Innovation workshop, NTIF 2017; Peggy Peng & Robert Etches, The Blockchain Conversation, TAUS 2018, Jochen Hummel, Sunsetting CAT, NTIF 2018. See Aagaard & Etches This changes everything for the sociological and economic importance of communities, the circular society, and the sharing society. A dynamic actor in the language industry for 30 years, Robert Etches has worked with every aspect of it, achieving notable success as CIO at TextMinded from 2012 to 2017. Always active in the community, Robert was a co-founder of the Word Management Group, the TextMinded Group, and the Nordic CAT Group. He served four years on the board of GALA (two as chairman) and four on the board of LT-Innovate. In a fast-changing world, Robert believes there has never been a greater need to implement innovative initiatives. 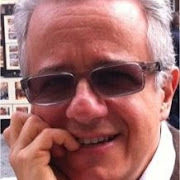 This has naturally led to his involvement in his most innovative challenge to date: As CEO of Exfluency, he is responsible for combining blockchain and language technology to create a linguistic ledger capable of generating new opportunities for freelancers, LSPs, corporations, NGOs and intergovernmental institutions alike.